Home » Blog » Mobility » Free floating. Too free. Surely the digital world is having an impact on the economy and daily life of many of our Country citizens, especially, but not exclusively, in major cities. The digital revolution has brought to everyone’s attention, often even on newspapers before that in most people’s lives, the disintermediation of Uber, bombarded with eggs, protests and strikes by taxi drivers, and the revolution in home deliveries of pizzas, sushi or kebab, again followed by a media trawling on the working conditions of the various cyclists of Foodora & co.
Then it was the turn of the tiny white Smart cars from Car2GO that darted through the city streets leaving many curious about those cryptic and playful phrases written in big blue characters on their car doors. Then everyone: in a blink of an eye many players amongst which ENI and BMW crowded the Italian roads with thousands and thousands of car sharing automobiles. Soon after the invasion was joined by all sorts of vehicles, from mopeds to vans, something absolutely positive even if we have lost an incredible as rare opportunity with car sharing. Let there be bikes. Yep, free floating bicycles. As if t wasn’t dangerous enough to ride a bike in most Italian cities amongst double parked cars, cycle paths transformed into car parks or loading/unloading areas for trucks and vans and, because cyclists are a bit both victims and executioners, streets taken against direction of travel, sidewalks used as a launching pads from which to throw themselves in the street, crossings streets with 4 lanes ignoring red lights or driving with their lights off in the night to see whether it is really so difficult to die. Finally I understand the expression urban jungle. I often find myself having odd thoughts. A visceral need for more rules. I write this almost with fear, as admitting something to be ashamed of. Maybe fearing that, by saying it, this hidden urge becomes real and concrete. Yes, I think we need a few more rules. I am a fan of car sharing and, more broadly, I strong believer in digital innovation, especially when it improves the live of individuals and communities. My issue with free floating bikes by the various OFO, MoBike etc is precisely the floating. Free from any social norm. 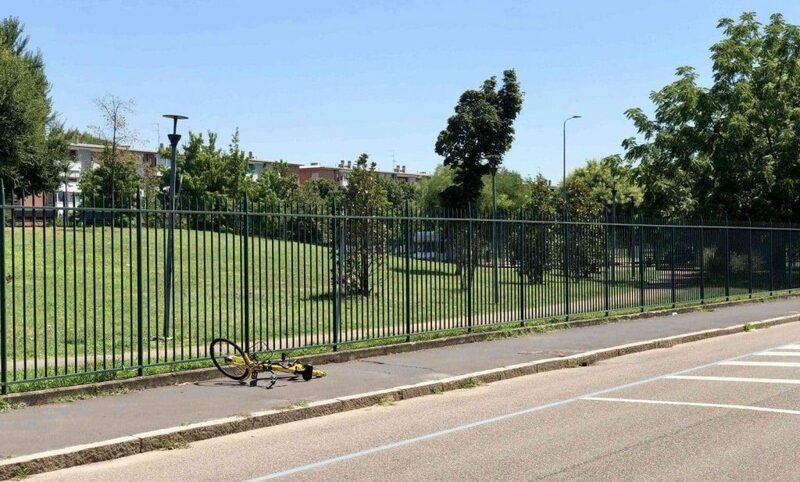 The possibility that, whoever, can leave a bike, not belonging to them, wherever. With good acceptance from others. So we find ourselves living in muddled, chaotic cities, that remind us more of those megalopolis with unpaved roads that you discover traveling through Asia, filled with smell of curry, dust and vehicles parked everywhere, anyhow. No rules. No decor. No respect. Hence, these colourful and cheap bikes fill every corner of the city. Untidy. Some of these in Milan, I’ve never understood whether because of a student spirit or a brilliant marketing stunt, they have been dredged from the bottom of the naval dock. Because if something is everyone’s, it’s often nobody’s. With car sharing all of this doesn’t happen, because there are pre established locations to park in: whoever leaves a car elsewhere will be fined as expected even if no longer driving. With bikes it doesn’t happen, and honestly, what officer has ever given a ticket to a cyclist? I don’t know if the solution would be to ban the free stall: create dedicated areas where to park. Probably not, I don’t think so: it would completely unsettle and ruin the fruition model of these vehicles. Perhaps they could be plated. Adding a number plate on each bike and fine whoever doesn’t park it in a civil manner, whoever skips a red light or proceeds against the direction of travel putting at risk their lives, others’ lives, and the bike. Then again fine once and for all vehicles parked on bike paths as it truly is something uncivil, even if just for 5 minutes. And no, I don’t ride my bike around the city.